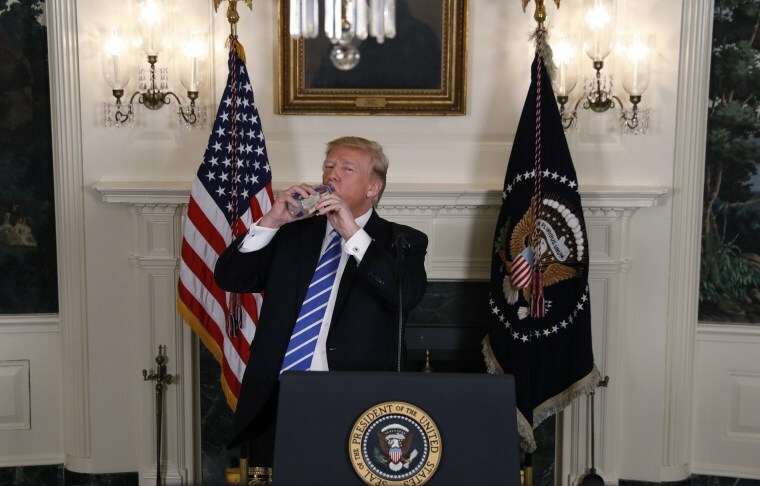 WASHINGTON — President Donald Trump was very thirsty — for more positive news coverage of his lengthy Asia trip, and for some water. While speaking animatedly at the White House on Wednesday about his 11 days abroad, Trump abruptly stopped talking and stooped to look for water behind the podium. Staffers typically leave a bottle or glass of water under the podium, but this time the president came up empty. "They don't have water," Trump said. "That's OK." A voice in the wings alerted him to a bottle of Fiji water within arm's reach that the president hadn't seen. Trump grabbed for it, seeming to try to keep the bottle away from his body and out of camera view as he unscrewed the cap before taking some gulps, reminiscent of another ill-fated political water bottle sip a few years ago by Sen. Marco Rubio of Florida — which Trump had previously mocked. Trump had been merciless about Rubio's ill-fated drink that went viral during his Republican response to President Barack Obama's State of the Union address in 2013. "Do you remember that catastrophe?" Trump said on the campaign trail early last year, speaking of one of his rivals for the GOP nomination. During that rally, Trump brandished a water bottle and dumped water around the stage, yelling, "It's Rubio!" The Florida senator wasn't the only one poking fun at the president, with journalists taking to Twitter to make light of the moment. And of course, no news cycle is complete without an old Trump tweet as fodder for the fire. Next time Marco Rubio should drink his water from a glass as opposed to a bottle—would have much less negative impact. After his lengthy remarks on Wednesday about his trip to Asia, Trump didn't respond to shouted questions from the press about whether Alabama GOP Senate candidate Roy Moore should quit the race.